Time to make our way through more Madecasse chocolate. 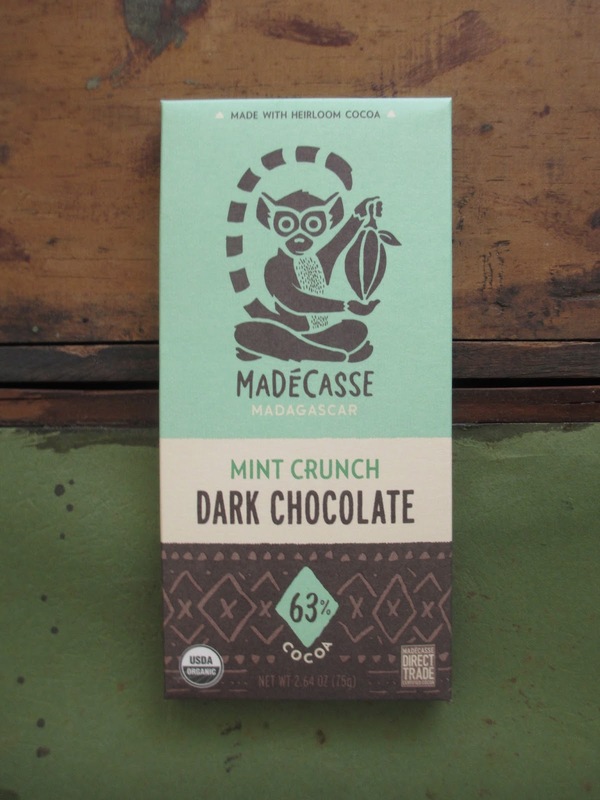 This time the familiar lemur sits against a green background--because this is the Mint Crunch Dark Chocolate bar. The cocoa content is 63%. As soon as I broke the seal on the foil wrapper, out came the scent of Andes Mints. This was, for the first moment, a welcome and inviting scent--Andes Mints, after all, can be rather nice. But then I began to wonder if that was really the scent association that I wanted to find--Andes Mints, after all, are also rather cheap. The same mint scent carries through to the taste, so the mint aspect of this chocolate bar is the same as in Andes Mints. Andes Mints are labeled as containing "peppermint oil" and this bar lists "organic mint oil." Pretty much that's the same ingredient, at least as far as taste goes. While this particular mint taste is often the flavor that we get in products, it just . . . doesn't taste all that much like a mint leaf. Here's my problem. Andes Mints, while they're marked as something to add sophistication to get-togethers (like Ferrero Rocher), they're in the same category as Hershey's Kisses--that is, the mass-produced candy category. So that's the scene with which I associate this particular mint flavor. But the other elements of this Madecasse bar suggest a different scene. I have spoken favorably in the past about most of Madecasse's dark chocolate, and the same goes for this case. In addition to the chocolate (which is already a different species from candy chocolate), there are nibs in this bar. This is where the Mint Crunch part comes in. The use of cocoa nibs to give that crunch is a smart idea. Nibs do have that pleasant and particular crunch that's hard to describe but impossible to not recognize. So I like the idea of just adding this basic chocolate product instead of adding cookie pieces or something like that, in which case you'd also be adding in at least another five ingredients. The thing is, though, nibs elevate the chocolate and draw more emphasis to the richer, more flavorful notes. This would be great--except that then there are two opposites in this chocolate. Fresh and flavorful cocoa and watered down mint oil. And it isn't that this chocolate is bad. It tastes fine and maybe majority of people wouldn't be pausing over it as long as I am. I just think that it could be (and was so close to being) better. I'm only being hard on Madecasse because I expected more from them. You know when you unwrap certain chocolates and get a fresh mint scent, like there's a mint plant right next to you? That's what I wanted here.